Religious leaders joined a chorus of pleas for federal intervention in the crisis and a permanent social safety net. They celebrated the New Deal as a religious triumph. Yet some complained that Franklin Roosevelt cut the churches out of his programs and lamented their lost moral authority. Still others found new opportunities within the New Deal. By the late 1930s, the pattern was set for decades of religious and political realignment. This book is about an unprecedented attempt by the government of Russia’s Tsar Nicholas I (1825-1855) to eradicate what was seen as one of the greatest threats to its political security: the religious dissent of the Old Believers. The Old Believers had long been reviled by the ruling Orthodox Church, for they were the largest group of Russian dissenters and claimed to be the guardians of true Orthodoxy; however, their industrious communities and strict morality meant that the civil authorities often regarded them favourably. This changed in the 1840s and 1850s when a series of remarkable cases demonstrated that the existing restrictions upon the dissenters’ religious freedoms could not suppress their capacity for independent organisation. Finding itself at a crossroads between granting full toleration, or returning to the fierce persecution of earlier centuries, the tsarist government increasingly inclined towards the latter course, culminating in a top secret ‘system’ introduced in 1853 by the Minister of Internal Affairs Dmitrii Bibikov. The operation of this system was the high point of religious persecution in the last 150 years of the tsarist regime: it dissolved the Old Believers’ religious gatherings, denied them civil rights, and repressed their leading figures as state criminals. It also constituted an extraordinary experiment in government, instituted to deal with a temporary emergency. Paradoxically the architects of this system were not churchmen or reactionaries, but representatives of the most progressive factions of Nicholas’s bureaucracy. Their abandonment of religious toleration on grounds of political intolerability reflected their nationalist concerns for the future development of a rapidly changing Russia. The system lasted only until Nicholas’s death in 1855; however, the story of its origins, operation, and collapse, told for the first time in this study, throws new light on the religious and political identity of the autocratic regime and on the complexity of the problems it faced. Out this month from Harvard University Press is a new English translation of the eminent German medievalist Johannes Fried’s monumental work, The Middle Ages. The publisher’s description follows. Since the fifteenth century, when humanist writers began to speak of a “middle” period in history linking their time to the ancient world, the nature of the Middle Ages has been widely debated. Across the millennium from 500 to 1500, distinguished historian Johannes Fried describes a dynamic confluence of political, social, religious, economic, and scientific developments that draws a guiding thread through the era: the growth of a culture of reason. Beginning with the rise of the Franks, Fried uses individuals to introduce key themes, bringing to life those who have too often been reduced to abstractions of the medieval “monk” or “knight.” Milestones encountered in this thousand-year traversal include Europe’s political, cultural, and religious renovation under Charlemagne; the Holy Roman Empire under Charles IV, whose court in Prague was patron to crowning cultural achievements; and the series of conflicts between England and France that made up the Hundred Years’ War and gave to history the enduringly fascinating Joan of Arc. Broader political and intellectual currents are examined, from the authority of the papacy and impact of the Great Schism, to new theories of monarchy and jurisprudence, to the rise of scholarship and science. The Middle Ages is full of people encountering the unfamiliar, grappling with new ideas, redefining power, and interacting with different societies. Fried gives readers an era of innovation and turbulence, of continuities and discontinuities, but one above all characterized by the vibrant expansion of knowledge and an understanding of the growing complexity of the world. 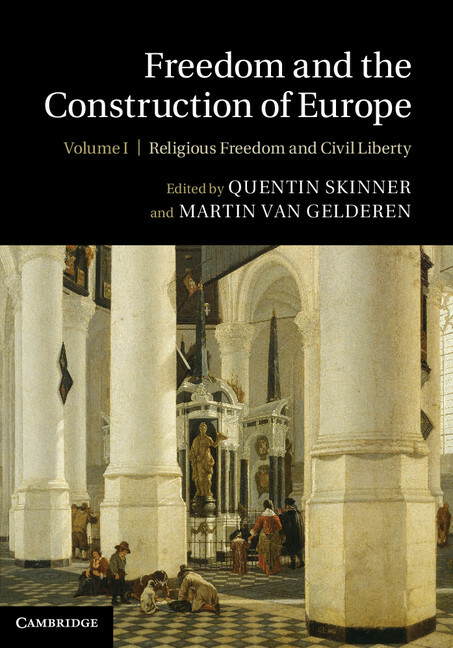 This month Cambridge University Press published Freedom and the Construction of Europe edited by Quentin Skinner (University of London) and Martin van Gelderen (European University Institute). The publisher’s description follows. Next month Cambridge University Press will publish Empire and Power in the Reign of Süleyman: Narrating the Sixteenth-Century Ottoman World by Kaya Şahin (Indiana University). The publisher’s description follows. 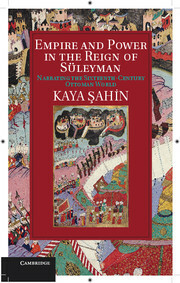 Kaya Şahin’s book offers a revisionist reading of Ottoman history during the reign of Süleyman the Magnificent (1520–1566). By examining the life and works of a bureaucrat, Celalzade Mustafa, Şahin moves beyond traditional, teleological approaches and argues that the empire was built as part of the Eurasian momentum of empire building, and demonstrates the imperial vision of sixteenth-century Ottomans. This unique study shows that, in contrast with many Eurocentric views, the Ottomans were active players in European politics, with an imperial culture in direct competition with that of the Habsburgs and the Safavids. Indeed, this book explains Ottoman empire building with reference to the larger Eurasian context, from Tudor England to Mughal India, contextualizing such issues as state formation, imperial policy, and empire building in the period more generally. Şahin’s work also devotes significant attention to the often-ignored religious dimension of the Ottoman-Safavid struggle, showing how the rivalry redefined Sunni and Shiite Islam, laying the foundations for today’s religious tensions. 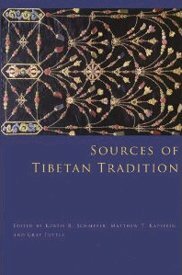 This month Columbia University Press will publish Sources of Tibetan Tradition edited by Kurtis R. Schaeffer (University of Virginia), Matthew T. Kapstein (University of Chicago), and Gray Tuttle (Columbia University). The publisher’s description follows. The most comprehensive collection of Tibetan works in a Western language, this volume illuminates the complex historical, intellectual, and social development of Tibetan civilization from its earliest beginnings to the modern period. Including more than 180 representative writings, Sources of Tibetan Tradition spans Tibet’s vast geography and long history, presenting for the first time a diversity of works by religious and political leaders; scholastic philosophers and contemplative hermits; monks and nuns; poets and artists; and aristocrats and commoners. The selected readings reflect the profound role of Buddhist sources in shaping Tibetan culture while illustrating other major areas of knowledge. Thematically varied, they address history and historiography; political and social theory; law; medicine; divination; rhetoric; aesthetic theory; narrative; travel and geography; folksong; and philosophical and religious learning, all in relation to the unique trajectories of Tibetan civil and scholarly discourse. The editors begin each chapter with a survey of broader social and cultural contexts and introduce each translated text with a concise explanation. Concluding with writings that extend into the early twentieth century, this volume offers an expansive encounter with Tibet’s exceptional intellectual heritage.